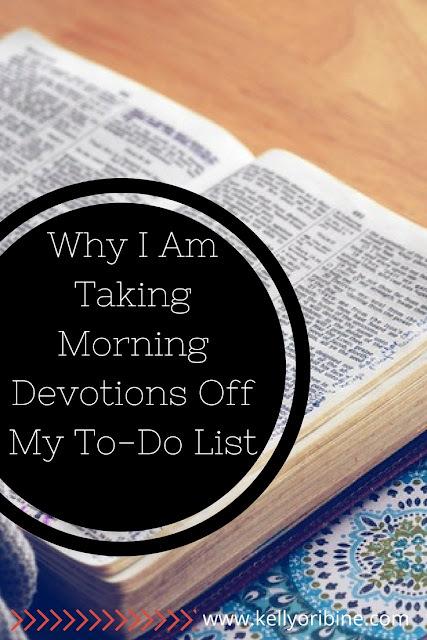 I've so often felt like a bad Christian for skipping morning devotions. Can you relate? I had bought into the guilt laden messages I'd heard early in my Christian walk. "God has given everything for you, surely you can give a few minutes of your morning to him." I felt like I owed that 5, 10 or 30 minutes to God and that I was somehow stealing from him when my feet hit the floor running in the morning. It was one more thing in my life where I was a failure, I didn't measure up. One more article of shame to wear through my day. And when I did do my devotions? It was a crossing off of a to-do list item. I was fulfilling my good-christian-girl duty. 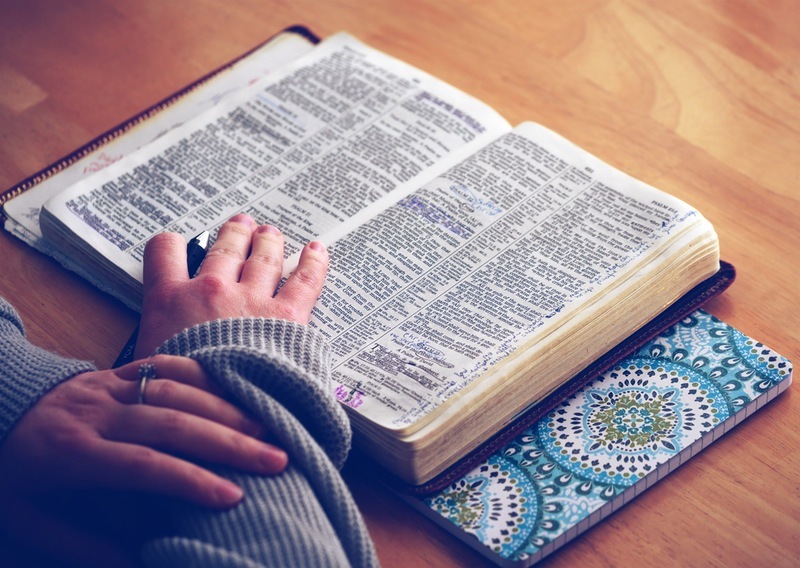 It didn't matter if I was being transformed by God's word or if I was finding what I need in Him, only that I did my christian duty, earned my place in the pews. But I was so mistaken. When I don't take time in the morning to read scripture and pray or do a morning meditation, God is not robbed. But perhaps I am. In a world that is constantly telling us how we don't measure up, that we are not enough, that if we only try harder and do better we can earn the space we take up in this world, it is a sacred and divine act to stop, to push back against the demands and expectations for a moment, and meet God. It is an act of radical self love to return to the source of our identity, to remember who we are and who He is. Not shame. But love. Love for the way God has made us. Acceptance that we can better do His will when we've stopped, breathed slowly, and sat in the quiet with our Lord. I am coming to believe that recognizing God for who He is, and seeing my place in Him, is the great work of my life. Morning devotions are not a to-do list priority of elite Christians, it is not an extending of an olive branch to win over a God who is mad or disappointed in us. It is a basking in a God who already adores us, as our whole and honest selves, laid bare and weak and accepted. As I write this, we are only a few days into a new year. A time when so many of us make resolutions to do better, to be better. To embrace the fresh start that a new year seems to bring. And some of us have recommitted to morning devotions. Maybe for the umpteenth time. And that is not a bad thing. But friend, will you believe me when I tell you this? There is nothing you can change this year to make yourself more worthy of Love. Nothing you do or don't do will make God like you more. Our God does not carry a cosmic checklist, awarding us gold stars for remembering our daily devotions. He does not offer us a way of life, a series of empty striving to be made acceptable before Him. He gives us His very self. He gives us his presence. He longs for us to be satisfied in Him. May we rise each morning to meet God is a powerful way. Not out of duty, not to assuage our guilt, but in order to connect with the source of our one true identity, to fuel up in an awareness of who we are and where we stand in this world in the sight of a perfect and mighty God who delights in us. Morning devotions are not something we ought to do, to earn our maker's love or our place in the pew, but something we get to do. A privilege we are free to enjoy. An opportunity to come before the almighty God, to sit boldly in His love and acceptance before walking out into a world that that tells us we will finally be enough if we just do this, be that, or buy those things. No, I will no longer let my morning devotions be a place of guilt and failure. Instead, they are a divine appointment with the maker of my soul. An opportunity to put down my striving and vain attempts to wrestle acceptance out of a God who has already redeemed and accepted me. And if I miss that appointment? Friend, fresh starts are always available. He doesn't bury me in shame. He just beckons me to come to Him. I love your blog, Kelly! Thanks for sharing a fresh perspective! Thanks so much for this post! I have really been struggling with this. I've always been a huge "to-do list" person, and I often feel obligated to do things (such as devotions, because I know it's just what Christians are supposed to do). I've really been trying to change my mindset on this — that God isn't mad at me if I don't do my devotions. Thank you for sharing!